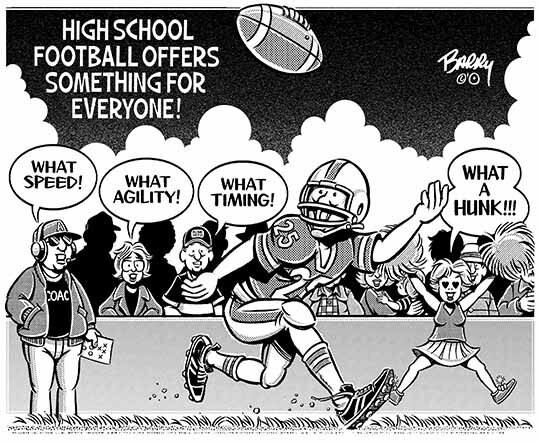 Today I’m attaching 3 FOOTBALL cartoons for you to pick from, each of them focusing on a different aspect of our beloved small town sport — with all of it’s swell photo opportunities! #1 ~ "FOR EVERYONE" presents a variety of views on a local FOOTBALL star. Yep, while most towns share many similar characteristics, they also embody a whole bunch of differing perspectives, eh? — like, one per resident??? HA! #2 ~ "CAN’T RELAX" pays tribute to those excited [albeit anxious!] 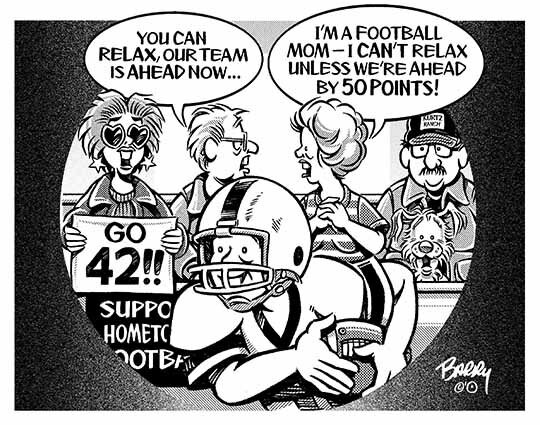 FOOTBALL moms who frequent every home game — God love ‘em! 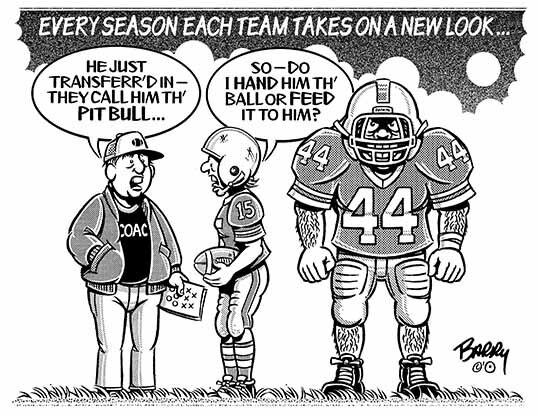 #3 ~ "THE PIT BULL" concerns how every year local teams take on a "new look." Surely, there’s a player on your hometown roster who’s earned a rep for intimidating opponents [no matter if he’s a new kid in town or not]. And so it goes with the transplanted #44 in this toon. Go ahead — czech 'em all out. You just may find one that suits you better than those I’m attaching here.